Just add water. Nutritiously delicious. Suitable for vegetarians. Nutritiously Delicious Ovaltine... simple add hot water & enjoy a deliciously soothing malty drink as you unwind anytime of the day! Made with the wholesome goodness of barley malt & cocoa, Ovaltine's unique recipe contains essential vitamins and minerals. Source of Iron and Vitamins A, C, B6 & B12, which support the normal function of the immune system. 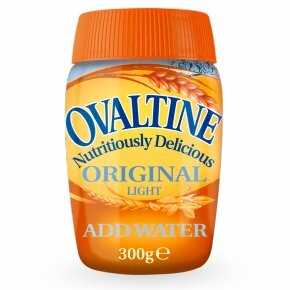 Ovaltine light - contains at least 30% less fat than standard malted drinks. Directions For best results put 4 teaspoons of Ovaltine in a mug and add hot water (200ml).